I am an International Allbreeds judge who has judged many specialties and Group specialties as well as All breed shows both in Australia and overseas. This website is about my love of cocker spaniels and features my artwork which you will find on the Drawn In page, I do commissioned drawings and paintings from photographs you will find prices on my Drawn In page. I also have a page dedicated to my Year Books - Cocker Spaniels Downunder - featuring advertisements from Cocker breeders all over Australia and New Zealand. 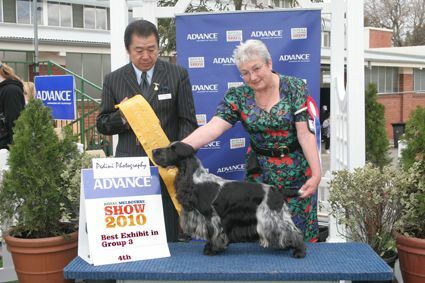 Cocker Spaniels Downunder also has results from shows in Australia and articles about the cocker spaniels. Bolwarra Cockers came into existence in 1974 in Australia. We have been showing with continuing success since then. We encourage others into the sport of showing and breeding good cocker spaniels. We sometimes have Cocker Spaniel puppies for sale and are happy to place you on a waiting list. 2014 40 years of BOLWARRA Cockers. I have 3 Supreme Champions in the BOLWARRA prefix and 28 Champions in the BOLWARRA name. In 2014 October we moved to Sydney, We are still showing and judging and running a boarding kennel life is pretty full. 2016 was a land mark for me as I finally got to Crufts to see the fabulous English cockers I so enjoyed them will have to return.